I just listened to an interview of Tony Veney, a great track coach that has coached 3 NCAA champions, 33 All-Americans, and 15 conference Champions from UCLA, NC A&T, Cal State Northridge, and now at Ventura Community College. This guy oozes passion, experience, and love for his athletes. He explained that is when you go to a seminar, learn something new, and then immediately start using it with your athletes. “If it worked for the seminar leaders, it will work for me!” Right? It’s tempting to see what the greats do and attempt to replicate it with all your athletes. As Veney pointed out, that’s a great way to send most of your athletes home either disappointed or injured. Veney has learned a ton over the past 40 years of coaching and now goes through a deliberate process of assessment and customization. Sound familiar? The baseball world can learn a lot from the track world. The last blog we put out on weighted balls, Weighted Balls Hurt Arms ,was well-read by baseball folks across the country. Interestingly, people that have been advocating the use of weighted balls “Liked” the blog on social media. Changing minds? Time will tell. Following the issuance of the blog, I saw a tweet from a local little league that included an article from the San Jose Mercury Times that discussed arm injuries, Is Fastball Mania Putting Arms on the Brink? They can increase velocity. Frankly, this is not news as people have been using weighted balls for decades, but at a price. Keep reading. Many players will be injured following velocity-enhancement programs. This is not a surprise to us. The DSP staff rejected a nationally-known weighted ball program several years ago before the present frenzy because, despite the reputation of the well-known founder, positive national TV coverage, and positive review of an independent medical review board, we didn’t believe it was the right thing for young athletes. Rejecting that program was one of the best decisions we ever made. That weighted ball program did not focus on what our clients really needed. Because of our societal “norms” with regards to how children are raised, clients come to us riddled with constraints. Weighted balls won’t address those critical dysfunctions. Experience, reason, and knowledge we gleaned from non-baseball sources helped us make that decision.. The Mercury Times article said sports-medicine leaders Mike Reinhold (former Red Sox trainer) and Dr. James Andrews (godfather of Tommy John UCL surgical repair) combined forces to try and put some real data behind the professed efficacy of weight balls. As reported in the Mercury Times, the duo’s study showed that 86% of the study group achieved an average of a 4% increase in velocity. Hooray. In return for that 4% increase was a better than one in four chance to be injured! That’s right, 27% of the group that was under the supervision of these greats of the sports-medicine world were getting injured during or following the six week program. Top minds and a conservative approach got more than one in four athletes in pain! Can you imagine what un-trained, results-driven coaches, and profit-minded-trainers are doing to young throwers? It’s ugly out there, my friends. Let’s bring this into tangible terms. For a middle-schooler that throws 55-60 mph, he or she can subject themselves to a weighted balls program and gain on average a little over two (2) mph for a better than 25% chance of getting injured. Parents, players, coaches….If you take away nothing else from this blog, please take away the fact that this is an unacceptable risk-reward ratio. There is a much better, safer way for young athletes. A large portion of our client-base at DSP are middle-schoolers from ages 11 – 14. Because we use the FMS (see Why We Use the FMS) we know that they all come to us with multiple physical constraints like weakness, instability, and immobility. The subjects of the Reinhold-Andrews experiment were likely older than our clients since that is where Mike Reinhold spends most of his time. It is safe to say that players in the college and professional ranks, are going to be more physically developed than all the young baseball athletes we train. The Reinhold-Andrews subjects probably had superior central nervous systems and DNA too. That’s fodder for a future blog, but I can make a compelling case that many professionals didn’t get there solely because of superior traditional coach-led-training. 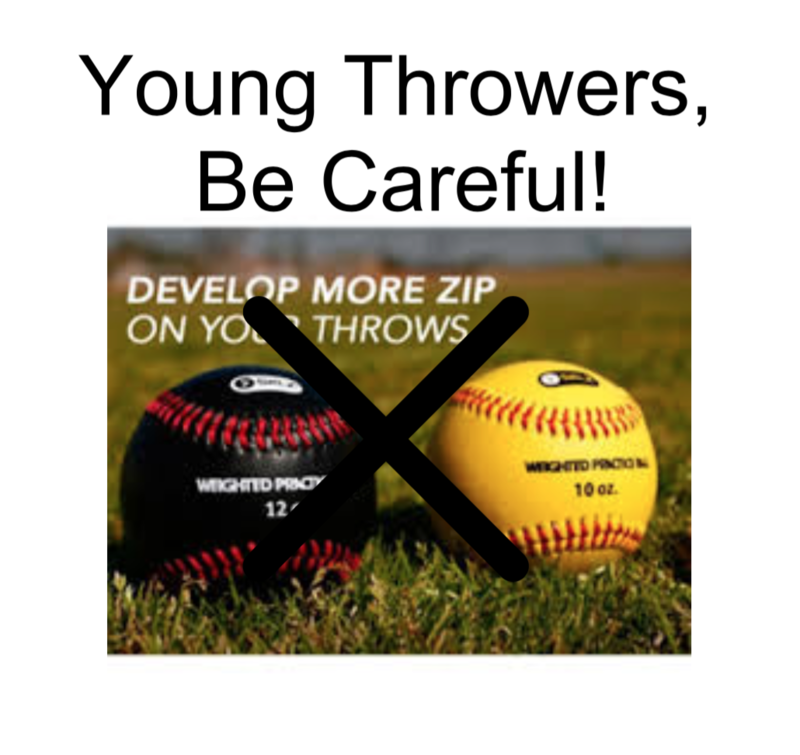 My point is that if superior athletes are getting hurt using weighted ball programs, why are coaches and trainers of young athletes using these programs? Weighted Balls have a place in arm-development. First things first though. Just like a good baseball team, one must have the fundamentals and be strong up the middle. Weighted balls do not pair well with weakness…asymmetries…locked-up toes and ankles…locked up T-spine…immature emotional state…the list goes on. Every young player will exhibit some or all of these constraints. A weighted ball program won’t address them. That means the resulting compensatory, dysfunctional movement pattern will be reinforced. Injury won’t be far off. Extrapolate! Don’t hurt your thrower. If you’re curious about what we do at DSP, please look at What Are You Doing With Your Throwers? . We regularly see gains in velocity that flow from gains in athleticism and health. Our methods are different than most baseball people use, especially when it comes to eradicating physical constraints. Check out Top Exercises for Throwers. At the end of the day, what we at DSP are really doing is helping young people be more athletic…helping them feel good…helping them be healthier…helping them see sport skill development through a new lens…helping them develop a love for training…helping them experience the correlation of effort and results…helping them learn to work side-by-side with their peers…helping them become more confident. Please contact us if you know of a baseball player or any athlete that wants help.